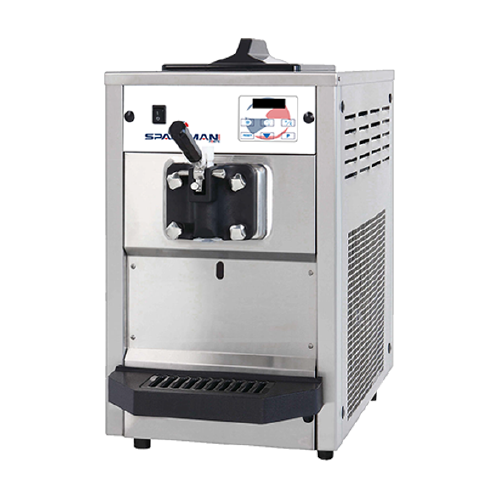 The Spaceman 6220 – Single Flavor, Low Capacity Counter Top Soft Serve Machine is Ideal for Ice Cream, Custard, Frozen Yogurt, Gelato, and Sorbet! The Spaceman 6220 soft serve machine is the perfect solution for any business that wants to offer ice cream, frozen yogurt, gelato or sorbet without the large space requirements or high price tag of other models. It will fit nicely on the counter top in bars, restaurant kitchens, delis or offices with a convenient 110V connection. The user-friendly digital control board allows the operator to change flavors, monitor servings, or adjust settings as needed. Patented freezing technology allows service of up to 18 qts/hr, or 144 small cones every hour, from the 1.8qt freezing cylinder. Hopper refrigeration maintains mix temperature below 4.4°C (40°F) during Cool and Standby modes.